Wiltshire Council marked the start of LGBT History Month today (4 February) with the raising of the rainbow flag at County Hall and the launch of an exhibition in the Atrium. Councillors, directors and staff are also showing their support by wearing rainbow lanyards. 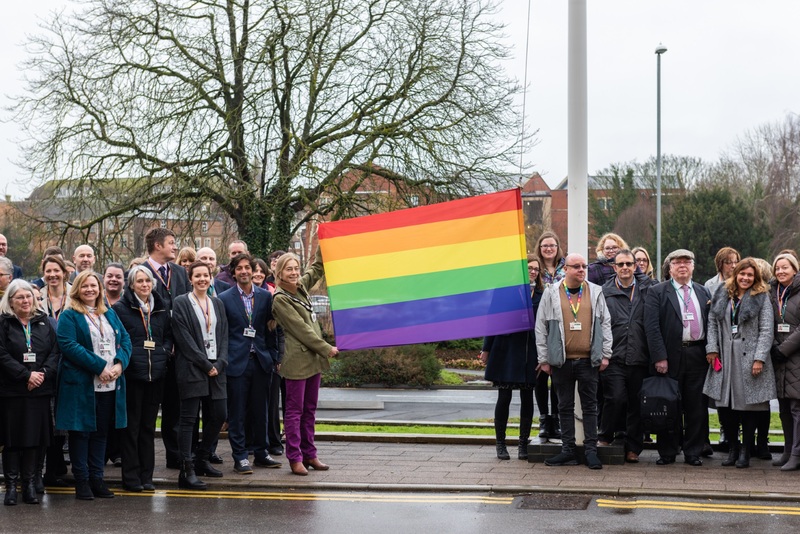 Allison Bucknell, Wiltshire Council Chairman and lead councillor for staffing equality, raised the multi-coloured flag with Wiltshire Council representatives including members of the LGBT Forum attending the ceremony. This year’s theme is peace, reconciliation and activism. There is an exhibition in the Atrium celebrating the people who have helped change attitudes to LGBT. The exhibition also focuses on the issues still faced and the struggles of those around the world. The exhibition runs until the end of February. To find out more and get involved, visit lgbthistorymonth.org.uk.